getcalc.com's Biot Savart Law Calculator is an online physics tool to calculate the magnitude of resultant magnetic field density at any point due to steady current flow of a current carrying conductor, in both US customary & metric (SI) units. 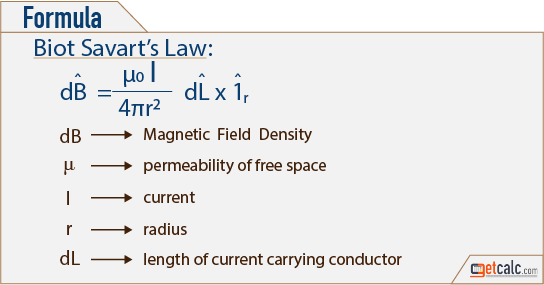 Biot Savart Law describes the basic relationship between the electric current and magnetic field. It's used to find the resultant magnetic field density B at any point P due to steady current flow of a current carrying conductor. It's a vector product measured in Teslas (T) or Newtons per meter per Ampere.